The fourth annual Mckenzie River Two Fly Tournament will be held this coming weekend, September 23th and 24th which can only mean that very soon conservation minded anglers will compete for both bragging rights and sweet prizes, having a great time raising funds for a good cause, better habitat for cold water fish! Previous tournaments have raised over $12,000 dollars for habitat restoration on the Mckenzie River including helping fund the Crescent Lake side channel reconnection and the Green Island levee removal project. These projects have improved habitat for juvenile Chinook as well as native trout but there is always more work to be done! This years proceeds will again go to the McKenzie River Trust. Seating is very limited but there may be a couple seats yet available. Entrance fee is $700 per team (or $350 per angler). Your fee gets you Friday and Saturday dinner Saturday guided fishing and lunch. Contact the shop at (541) 342-7005 to get one while you can! The event will kick off Friday night at 7pm. Mazzi of Hideaway Bakery fame will bring his wood fired oven to the shop for Pizza. Guide assignments, rules, and a brief McKenzie River Trust overview will be Friday evenings plan. Saturday, the teams will fish 9-5pm (scoring hours) and Saturday evening will be awards banquet and slider bar at the Oregon Electric Station. First prize is a stay at, Wild Billy Lake. The second prize winners will take home two Echo Ion reels, lines, leaders, hats and Frisbees and the third prize winners will receive custom packages of fly tying materials. All participants will receive a sweet official Ex-Officio Mckenzie River Two Fly Tournament shirt. 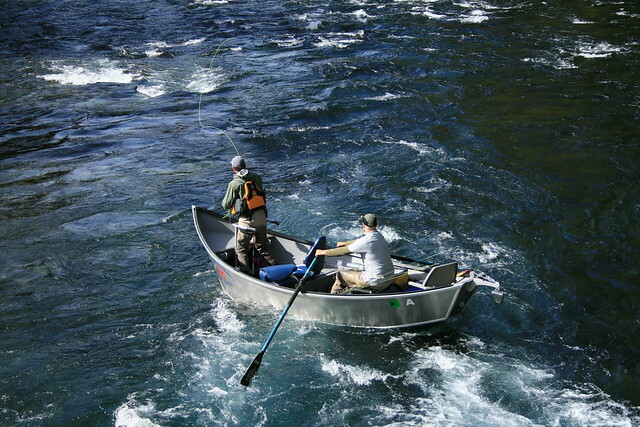 This entry was posted in Fly Fishing Contests, McKenzie River, Oregon Conservation News. Bookmark the permalink. Congrats to Ty, Joan and Darlene! Couldn’t be happier to see two local Damsel Flies and a wonderful Caddis guide take top honors in the 2-Fly Tournament! Good on ya!